For top-of-the-line patio enclosures in the St. Paul, Minnesota, area, turn to the experienced professionals at U.S. Patio Systems and Home Remodeling. We can turn your existing porch into a screen room that will protect you from harsh sunlight and biting insects, which means you won’t have to move the party indoors due to discomfort ever again. Studio – This style screen room will look great on any home and includes vinyl sashes that block up to 99 percent of harmful UV rays. Also, its thermal ceiling will help keep the enclosure much cooler. Cathedral – The high-vaulted ceiling of this enclosure is sure to add style to your patio and durable vinyl sashes will block harmful UV rays. Like our other top-notch enclosure, this screen room also comes with a thermal roof to keep the room cool. 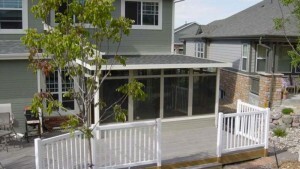 In addition to these patio enclosures, we also offer other beautiful and low maintenance sunrooms. In fact, if you ever decide you want to fully enclose your screen room down the road, we can install high-quality glass panels to transform your patio into an aesthetically pleasing and functional sunroom. For more information about the patio enclosures we offer to homeowners in the St. Paul, Minnesota, area, contact U.S. Patio Systems and Home Remodeling today. One of our friendly associates is available to answer any questions you have.